With City Builders: Rome creator Andrei Filip. 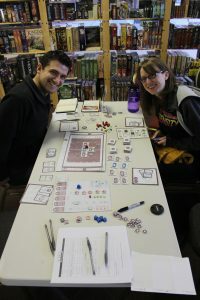 This past weekend, Blair and I had the pleasure of attending the first Unpub Mini Vancouver at Magic Stronghold in Burnaby. 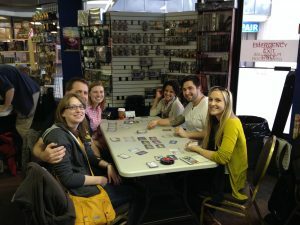 The event brings game developers and table top players together to playtest games and provide feedback, so that game developers can improve and refine their games. I have to say, I had a lot of fun at this event! It was a busy afternoon as we played games, got to know other fellow gamers, and had a good chance to chat with various game developers. One takeaway that was definitely apparent was how friendly and welcoming the table top community is. Unfortunately we weren’t able to make it for the whole day, but we still had the chance to play three of the games being demoed! A cooperative game where you must build a city in Roman times in the hopes of earning glory back home in Rome. At the same time, you must keep your population happy, keep raiders and looters at bay, while building your city before time runs out. Overall we both enjoyed the game. Initially the number of building type tiles was overwhelming, but the game was quick to learn. Learning World Defense Force from Adrian at Giant Monster Games. This is a fast-moving, cooperative card game where players work to destroy monsters that are attacking the world. Don’t work fast enough, and the monsters will eat the world population.This game had the group of us laughing hysterically as we tried to kill the monsters before the timer ran out. 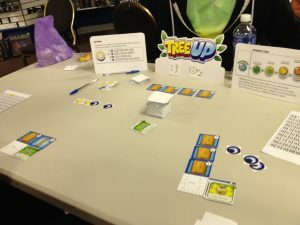 This is an easy to learn tile game where you build a tree and work to get inhabitants to move in for more points, while fending off attacks from your opponent. The concept of the game was really cute, and makes for a great game both for those new to gaming and for those experienced. It was nice to find a game that was for two players — since there’s not a lot of good ones out there — that provided a challenge for both but still fun. Other games that were demoed included Berlin Noire by Edward Disher, Custom Bot Combat by Kody Otter, Sloops! by Sébastian Bernier-Wong and Peter Gorniak, Town Builder by Eric Raué, For Greed or Glory by Parallax Games, and The Shrine by Jay Cormier and Shad Miller. We look forward to being able to playtest these titles at a future date!